Folding cage for securing gas or expensive equipment. 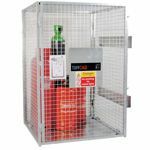 A robust, versatile high security cage, ideal for storing gas cylinders or expensive equipment. A unique innovative design allows it to fold down to just 180mm in seconds, without removing or detaching any parts. Benefitting from a fully galvanised heavy duty construction, the TuffCage is guaranteed to save you time, space and money!